ISLAMABAD, Pakistan — As Pakistanis went to the polls Monday to vote for a new parliament, early indications showed the party of slain former Prime Minister Benazir Bhutto in the lead, with that of President Pervez Musharraf trailing behind, FOX News has learned. Voter turnout was light to moderate, with fears of militant attacks and rigging keeping many Pakistanis at home. The elections were held Monday after a six-week delay in the vote, seen as a key step toward democracy after eight years of military rule under Musharraf, whose political survival hung in the balance. • Click here to view photos. Polling got off to a sluggish start in major cities, amid tight security after a wave of suicide bombings, including the Dec. 27 assassination of Bhutto. A bomb over the weekend also left 46 dead near the Afghan border. Public antipathy over Musharraf's support of the U.S.-led war on terror could count against his political allies, as could his recent declaration of emergency rule and purging of the judiciary to safeguard his controversial re-election as president in October. An overwhelming victory by the opposition, headed by Bhutto's Pakistan Peoples Party, or PPP, would leave Musharraf politically vulnerable, even at risk of impeachment. "It is the fate of the Pakistan People's Party that it will win, and we will change the system after winning," said Bhutto's husband Asif Ali Zardari after casting his vote in his hometown of Nawab Shah. Polls opened nationwide at 8 a.m. (0300 GMT) and were due to close at 5 p.m. (1200 GMT). The country's 81 million eligible voters also were choosing legislatures in Pakistan's four provinces. More than 470,000 police and soldiers were deployed nationwide and a public holiday declared to encourage citizens to turn out to vote. As well as fears of Taliban attacks, political violence also stalked the election. Four people, including a provincial assembly candidate from the opposition party of ex-premier Nawaz Sharif, died in a shooting Sunday night in the eastern city of Lahore. Bhutto and ruling party supporters wielding sticks clashed in Qadirpur in southern Sindh province, injuring six people, police said. But while fears of attack warded off some voters, sympathy for Bhutto and disaffection over rising food prices compelled others to exercise their democratic rights. "My vote is for the PPP," said Munir Ahmed Tariq, a retired police officer in Nawab Shah. "If there is rigging this time, there will be a severe reaction. This is a sentiment of this nation." Pakistan has lurched in its 60-year history between weak civilian governments and military rule — including the period since Musharraf's takeover in a 1999 coup. "This is about Pakistan and the government's relationship with its people, and it is about Pakistan's ability to show the world that it has a credible election, therefore a credible government," said U.S. Sen. John Kerry, as he observed voting in the eastern city of Lahore. 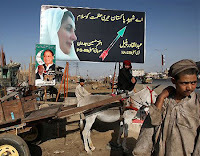 Two public opinion surveys by U.S. groups have suggested that if the election is fair, Bhutto's party will finish first, followed by Sharif's. The pro-Musharraf party — the Pakistani Muslim League-Q — is trailing in third. But the PML-Q still predicts it will fare strongly in rural areas of the largest province, Punjab, where the election is likely to be lost or won and where allegiance to feudal landlords, rather than a party's profile, can determine how people vote. Opposition politicians repeated charges Sunday — denied by officials — that the government plans to rig the balloting in favor of the ruling party. They warned of street protests if the balloting is manipulated. Musharraf, who recently ceded his command of Pakistan's powerful army, has warned he would not tolerate such protests which could set the stage for a dangerous confrontation in this nuclear-armed nation. He urged candidates to accept results of the vote with "grace." "If they win they should not show arrogance and if they lose they should show grace, accepting the result," Musharraf said in comments broadcast Monday on state television. Opposition parties and analysts claim that local authorities have used state resources to back ruling party candidates — claims that have been denied by the government, which has promised a free and fair vote. The last general election in 2002 which installed pro-Musharraf parliament were widely regarded as flawed and lawmakers provided little check on the president's dominance. But with power — and popularity — now diminished the incoming parliament could have more leverage. Police arrested an election official after 600 ballot papers went missing from a polling station in the southern city of Shikarpur, said police official Ali Mohammed Shahni, an area police official. Inflation, power outages and insecurity were key issues for voters. In Karachi, housewife Nargis Hamid just said she was voting for "peace" as the country could not progress without it. In Multan, Fatima Bibi, 45, said she supported Sharif's party to cut the price of flour and cooking oil. Mohsin Ali, a 24-year old business administration student in Lahore, said he cast his ballot at random to show support for democracy and contempt for Pakistan's notoriously corrupt politicians. "They are all simply seeking power and once they are in power we are nobody," said Ali, wearing a trimmed beard and a prayer cap. "Democracy has not been given a chance. Any time anything happens, the military steps in." In the remote border region of Bajur — a possible hiding place of Osama bin Laden and his top deputy Ayman al-Zawahri, hundreds of Pashtun tribesmen turned out to vote at a polling set up inside a government college, and dismissed the threat of attack. "We are not afraid of the situation. Death comes only once," said farmer Amanat Shah. A nearby, segregated polling station for women, was empty — a reflection of conservative attitudes in Pakistan's tribal belt. What next for new Thai cabinet? A Commentary on the "East Asian Miracle"